This new pub isn’t just curing your average weekend hangover. They’re curing their own locally-sourced bacon (and lots of it), and making us all feel better about life. 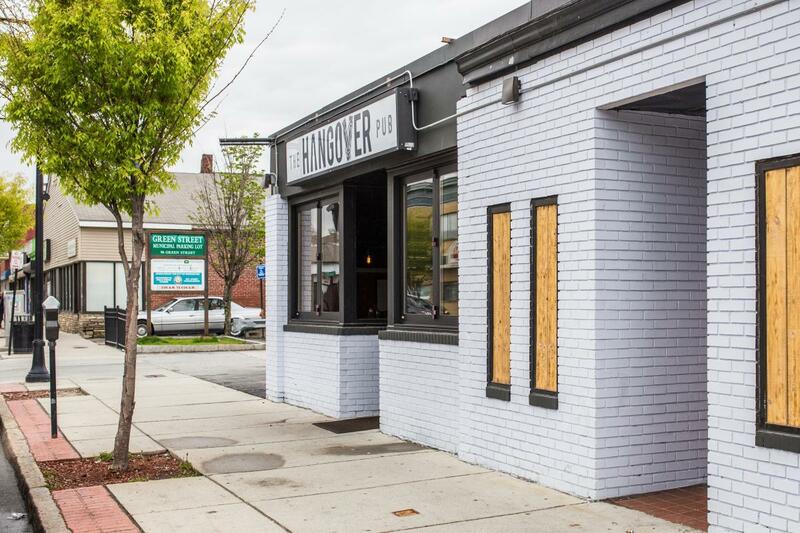 The vibe inside the new bacon-centric Hangover Pub in Worcester is relaxed and surprisingly artsy. The red-paneled walls of the 80-seat restaurant feature art by local artists of Worcester, all available for sale. The menu, written on a blackboard high on the left wall in obnoxiously pretty script, is an eclectic fusion of flavors from across the globe. Amy Winehouse’s deep contralto voice serenades the half-dozen people at the bar, who already seem to have established themselves as regulars in the short three weeks since the restaurant opened. "We wanted to create a place where you come in, have some great food, have some great drinks, enjoy some great bacon, and walk back out the door two hours later feeling a lot better about your life situation," says owner Jay Grey. "Essentially, we’re curing people’s hangover, for life." Grey told me that in the previous week alone, the restaurant went through 1,400 pounds of heritage pork belly from Blood Farm in Groton. The team cures it themselves over a seven-day process using no nitrates — just sugar, maple, and pepper. Some form of pig appears in most dishes throughout the menu — while bacon has quickly become the majority of the Hangover Pub’s identity, it is not the whole identity — but the star is the “man candy” (pictured above): thick-cut maple-glazed bacon with brown sugar, torched right before it arrives all warm and gooey in a cocktail glass at your table, meant to be eaten with your soon-to-be-sticky fingers. My bacon pilgrimage had only just begun, but honestly, it was worth the trip just for this one dish. "We wanted to feature the bacon somehow where it wasn’t [put] into something [else], but we also didn’t want it to be just a side of bacon," says Executive Chef Mike Arrastia. "It’s a little peppery, a little smoky, a little sweet, all at once." 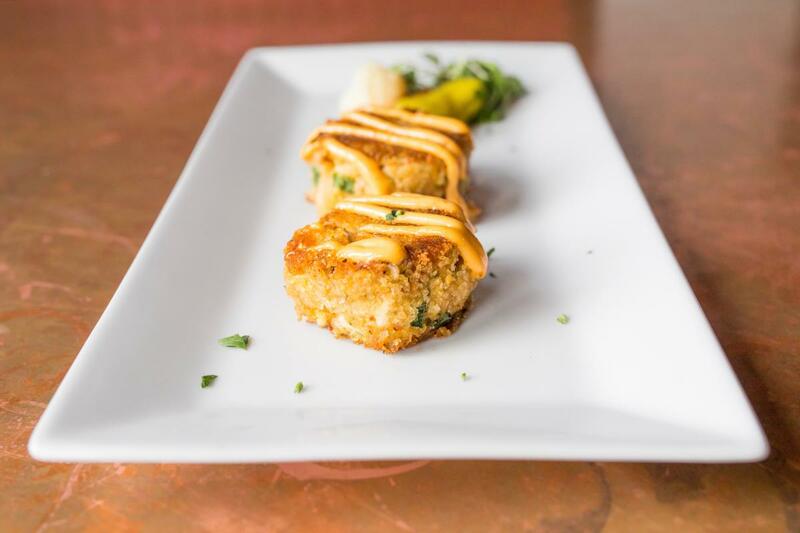 Next up are the bacon-and-crab cakes with a zigzag of spicy aioli over the tops, an understated dish that doesn’t stray too far from the classic crab cake — utilizing, but not highlighting, the restaurant’s signature ingredient. 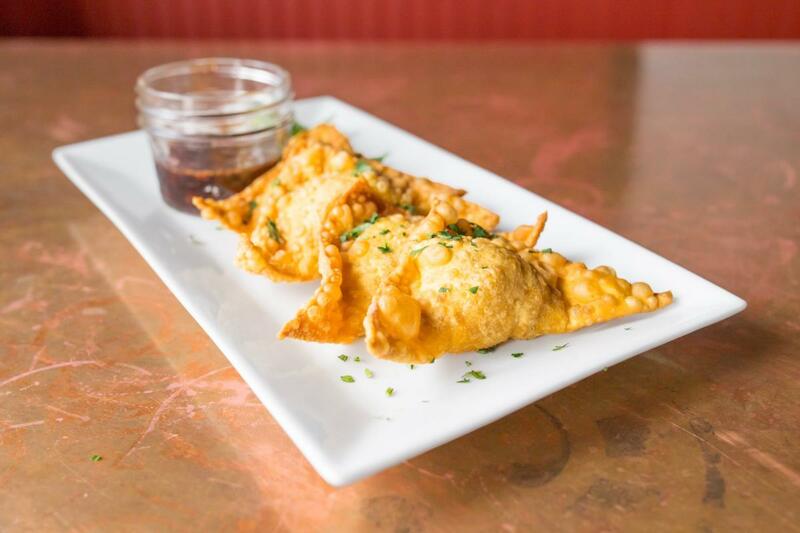 Then comes the crab Rangoon, a la Arrastia, in which he forgoes the traditional cream cheese filling for a combination of pork belly and goat cheese. A scallion pancake is used for the crispy dumpling, with a fig sauce on the side. The sauce is thin but flavorful, with strong notes of port wine and soy, plus figs, shallots, and thyme, designed as a twist on a traditional plum sauce, according to Arrastia. With no restrictions, Arrastia plucks flavors from all over the world and throws them together on a plate. He rattles off recent specials: shrimp-kimchi-pork-belly pizza with mascarpone-siracha cream sauce; Chilean sea bass ramen with lobster dashi, braised pork belly, and quail egg; tomorrow, pork osso bucco with saffron risotto and gremolata. The food certainly falls on the heavy side, so you’d think that I wouldn’t have room for dessert, but you’d be wrong. 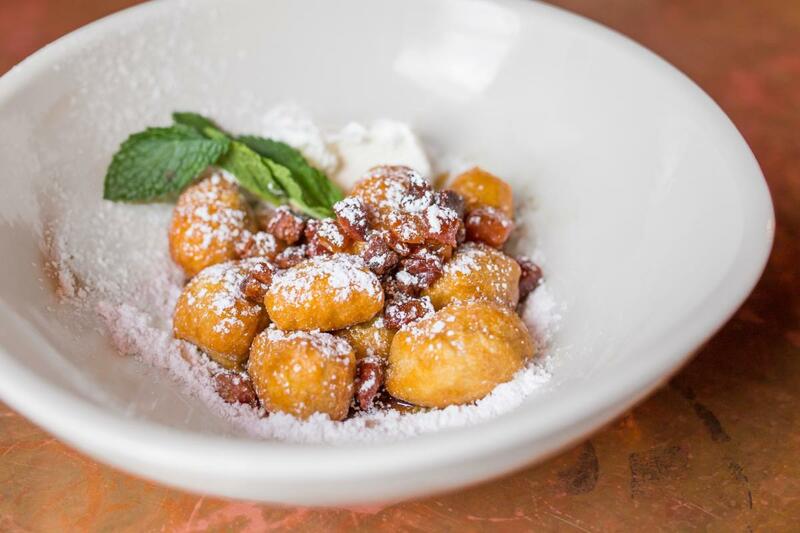 In this case, the finale was maple-glazed zeppolis — small pillowy Italian donuts — with little chunks of bacon, dusted with powdered sugar and garnished with mint. The food is as pretty as it is yummy, and when the check for my four dishes arrives, it’s easy on the eyes too. All menu items at the Hangover Pub ring in at $15 or under per dish. "We’re normal guys, we want to take care of normal people," says Grey. "We’re not some place that wants to price normal people out of the equation. We want to take care of as many people as possible." A little background makes this approach even more interesting. With no culinary school training, Arrastia worked his way into the metro west fine dining scene. He became a sous-chef at Rovezzi’s in Sturbridge and then executive chef at Allora in Marlboro, where the latter especially had menu prices that catered to a particular high-brow clientele, he said. It wasn’t an everyday restaurant for his friends and family. "I went to work, and nobody I knew ever went to the restaurants I worked at,” says Arrastia. “Now, everyone comes in here."